If your department’s website is in WordPress, you already have a profile, and you can add content to it through WordPress. 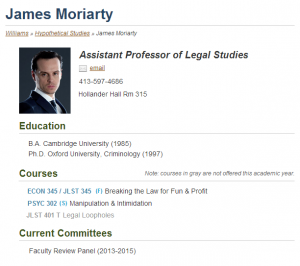 Profiles are not intended to be comprehensive – if you’d like to provide more extensive information about your teaching/research, you can create a separate website and link to it from your profile. The image to the left shows what an uncustomized profile, with just the automatically provided information, might look like. You can add and edit content, beyond the automatically provided information, through WordPress. You will need an account on your department’s website before you begin. If you have an account, you should be able to log into the site. If you can’t log in, contact your department’s administrative assistant or the web team to set up an account for you. After logging in, look in the upper right corner of the dashboard for a link that says “Howdy, [your name]“. Mouse over this link to reveal a menu (shown right). Click on the “Edit Williams Profile” link. If there’s no “Edit Williams Profile” link, you will need to create a profile first. 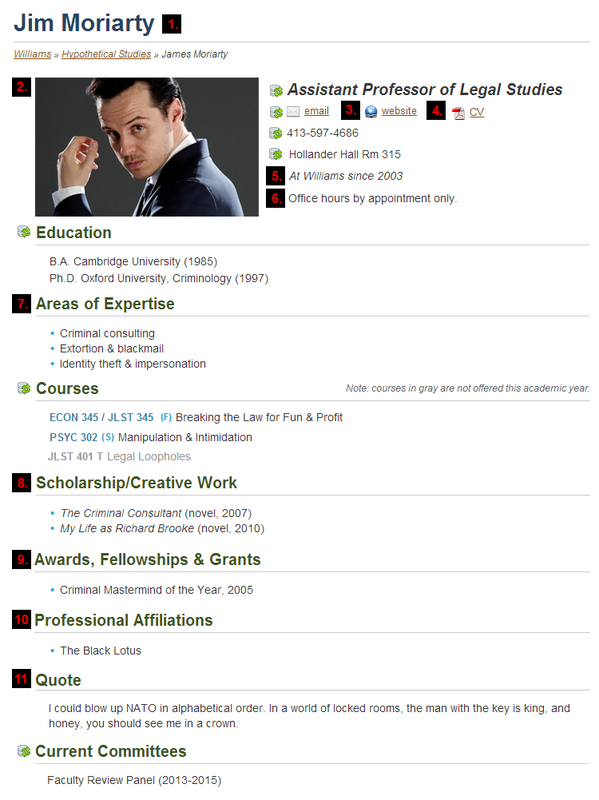 From the profile editing screen, you can see what your current profile looks like by clicking the green “View Williams Profile” button (shown left). Make sure to save your changes first! If you’ve never saved or published your profile before, the green button will read “View Default Profile”. Clicking it will show you the uncustomized version of the profile, with only the values drawn from the PeopleSoft database. Items editable via WordPress have a red number in a black box next to them. Look for the corresponding numbers below the screenshot for more details. Your full name, as you want it to appear as the title of your profile page. If this is not provided, the information will be filled in by PeopleSoft. By default, your photo from the Williams People Directory will be displayed. If you prefer, you can upload a different picture just for your profile page via WordPress. If you’d like to update your directory photo as well (the one that appears on your department faculty list, and the main college directory), refer to the directory updates documentation. 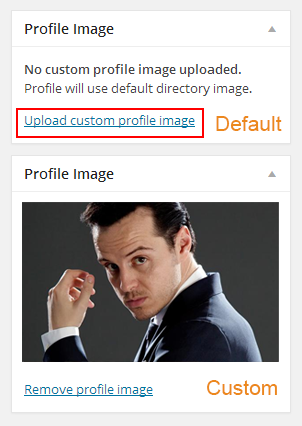 To upload a custom photo for your profile, look for the "Profile Image" box located on the right side of the profile editing screen (shown right), and click on the "Upload custom profile image" link (outlined in red). This will launch the media popup window, which allows you to upload a new file, or select an existing one from the media library. Please note: To be valid, uploaded images must have either a .jpg or .png file extension. The bottom half of the image to the right shows what your screen might look like if you've already uploaded a custom profile image. If you decide you want to use a different photo, click on the "Remove profile image" link located below the photo, then click the "Upload custom profile image" link that reappears to start again. Unlike the main directory photos, the profile photos do not need to be a specific size, or be just a head/shoulders shot. Feel free to choose something less formal, and let your personality/interests show. Optional. Enter the full URL (starting with http://) of your website in the “External Website URL” text box. Optional. Upload your Curriculum Vitae (in PDF format). If you need upload an updated version of the PDF, you should delete the old version from WordPress’ media library first (here’s why). Optional. Enter the 4-digit year you started working at Williams. Optional. Add office hours, a lab phone, or anything else a student might need to know to get a hold of you. All of these fields are optional, and start off blank. The headers for these sections will only appear if you fill them out. If fields 6-9 don’t cover all of your needs, or if you’d rather have a condensed “Biography” section instead of using the other fields, you can use the “Other Information” section. This section doesn’t come with a header- you will need to add one yourself (see editor toolbar, below). Instead of showing this profile, website visitors will be redirected to a different site- your personal website. Enter your site’s full URL, starting with http://. Required. In most cases, this field will already be filled in, and you will never need to change it. Your Williams User ID is your initials followed by a number (e.g. abc1) or the first letter of the first name followed by up to 7 letters of the last name (e.g. jdoe). Getting this correct is key- it’s the only way WordPress can associate the information you enter here with with your PeopleSoft data. You can use the same profile on multiple department websites. Decide which site you’d like to do your profile editing on (let’s say the History site, because you edit other pages there as well). On other department websites that display your profile (e.g. Leadership Studies), select “History” from the pulldown menu for primary profile site, and leave the rest of the profile blank. When visiting your profile on Leadership Studies, people will see information pulled from the History site. By default, your education section will list the years in which you received your degrees. Check off this box if you’d prefer not to display the years. Many of the profile sections have a simplified WYSIWYG editor that allows you to add more complex content. To upload an image, or upload a pdf/document use the “Add Media” button (orange arrow, below). To add a section header, place your cursor in a text block, and select “Header 3” from the formats pulldown menu (outlined in red below). This is most often used for the “Other Information” section, which does not come with its own header. You can add more than one Header 3 if you need multiple sections. The Header 4 format can be used to separate related subsections, such as books vs. articles under “Scholarship/Creative Work”. Phoebe Cohen (geosciences) uses a custom profile image that shows her interests. Ben Benedict and Aida Laleian (art) use photo galleries to display their creative work. Heather Williams (biology) uses the “Other” section to showcase her birdsong research interests and list her thesis students. Manuel Morales (biology) in addition to listing his publications, provides links to download them as PDFs or view them on the web. Justin Crowe (political science) uses his “Other” section to publish downloadable course syllabi.